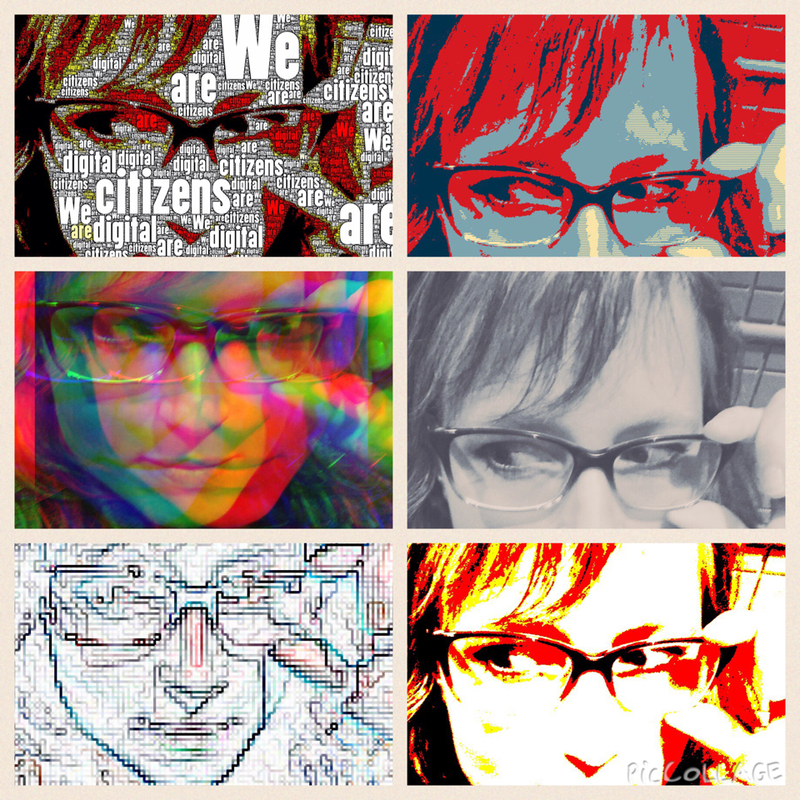 What is Digital Yoga and How Does It Help One's Creativity? The above video is a remix that Genna Rodriguez and I co-created. In this Summary of Learning I went way above and beyond my usual comfort zone... all thanks to the coaxing of Genna! Initially I was going to just create a video which showed some images and videos that connected to the class with a narrative and relaxing music (sort of what I did in ECI 831)... Then Genna shared her idea... Talk about stepping out of one's comfort zone! Next thing I new I was singing! Yes, singing! (Thank goodness for Autotune!!) Bopping to a beat (or trying to...), and reenacting what it was like to be working and... have 5 Google Plus notifications come up demonstrating that everyone else was finished their weekly blog. To make this remix we had to summarize our reflections on the course down to a few stanzas... Every syllable counted and had to match the cadence at which Bruno Mars sang in the original song, Uptown Funk. We used Biteable as our main platform for the song, which was then downloaded and mashed with green screen videos of our awesome acting and grooving to the beat as well as Jib Jab for the guest appearance of Katia and Alec. Thank goodness for Genna's Mac which, as I mentioned above, has auto-tune! If there wasn't this option, I don't think I would have sang! This post was co-written with Genna Rodriguez. This is it... You know when you go on a crazy action-packed vacation, then you come home... You feel glad that you're home and you can get back to routine and normal life... but you also feel changed from your journey. Well as corny as it sounds, that's how I feel. Now that we have journeyed through the Rabbit Hole and back, it's hard to look at everything with the same lens. Well, here we are, at the end of the semester. Genna and I have put in more hours than we can count into this project, but the learning journey and opportunity to ignite dialogue about true technology integration (which always has student learning at the center), has been a real rewarding experience. Initially we thought we would just create a framework for 21st Century Learning, as explained in our original posts. 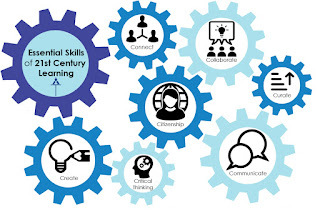 This meant identifying the essential skills students would need, based on the ISTE Standards and the work of Michael Fullan, then coming up with the definitions, skills and tools that would guide students in their learning in today's world. Then the Ministry released the Digital Citizenship Continuum. THIS CHANGED EVERYTHING. This made what we had planned seem so undeveloped. So we decided that we would try to match the efforts of the awesome team who had composed the Digital Citizenship Continuum. After a Skype meeting with Alec and Katia, they said that this sounded like a huge undertaking. Wow, were they right! Forty-seven articles, videos and blog posts later, we realized just how huge this was. But we were committed to get it done! Overall we are quite happy with how it turned out. It was challenging trying to narrow down the essential questions and knowledge that students need, but we decided that it was better to offer these considerations for teachers. The Scope and Sequence is quite easy to navigate (or at least we hope so!) for the grade groupings as we hoped to scaffold learning, so that teachers could see the progression of skills being taught. Teachers are able to view the Scope and Sequence for each of the C's as well as the definition. 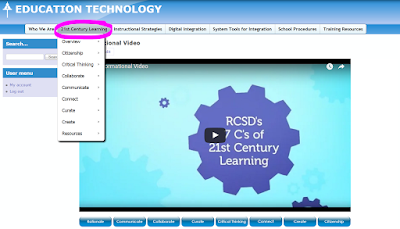 Under the "Overview" you can review the rationale, an informational video which explains how the C's or Essential Skills of 21st Century Learning fit together, as well as resources - which are our presentations, lesson framework and teacher lessons. 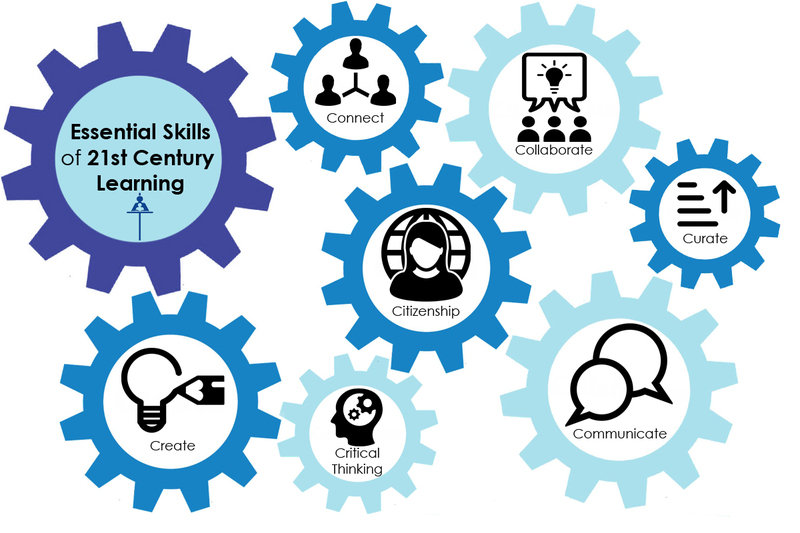 One of the key aspects of our project was not only developing the framework for the Essential Skills of 21st Century Learning, but to start implementing the concepts into our presentation. As part of our rationale, we had decided that Digital Citizenship would be identified as just Citizenship, as there needs to be connection between the online and offline world. One aspect of our jobs is to train teachers on how to integrate the Digital Citizenship Continuum. In addition to teachers exploring the Continuum, they developed lessons using the new framework we had designed. Going forward we hope that teachers will use the framework template or at least consider the 7C's when planning. So far 14 teachers from K - 12 have submitted lessons for our database. You will find our project on our new division website (on the Drupal platform). 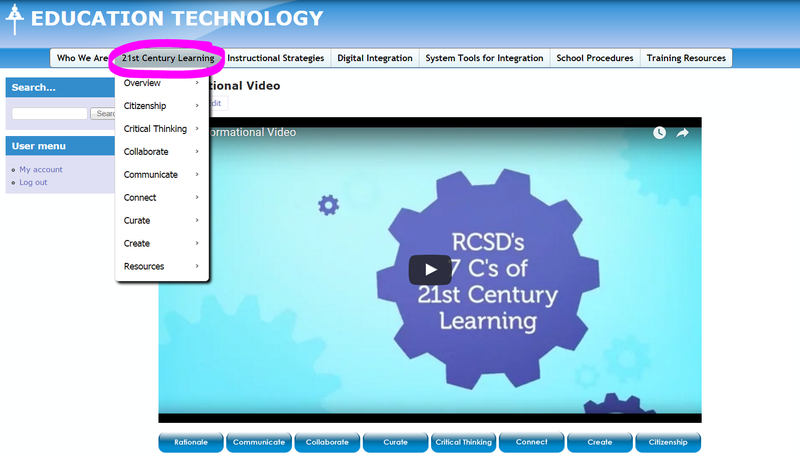 Our division is still in the process of building our website, but our project includes everything under the "21st Century Learning" tab (as circled below). We hope you find our project useful and we welcome any feedback you have. We will continue to develop our project throughout the year, but we are very proud of what we have accomplished at this point in time! Click HERE to visit our project website! This video can also be found on the website, under the Overview tab. The following are presentations we have provided to teachers over the course of the past few months. Our goal was to explore with teachers how digital citizenship can be infused into curriculum authentically and seamlessly, but also provide opportunities for teachers to understand the literacies or fluencies that students need today. These presentations are located below. Note: If you notice some weird formatting issues on the presentations when viewing them in the Scribd window, this is just some issues with Scribd, which is fixed when the presentation is downloaded. Finally, one last thing. I just wanted to share the Summary of Learning that Genna and I had composed together. Initially I was going to just create a video which showed some images and videos that connected to the class with a narrative and relaxing music (sort of what I did in ECI 831)... then Genna shared an idea... Talk about stepping out of one's comfort zone! Next thing I new I was singing! Yes, singing! (Thank goodness for Autotune!!) Bopping to a beat (or trying to...), and reenacting what it was like to be working and... have 5 Google Plus notifications come up demonstrating that everyone else was finished their weekly blog. Here is a video I made back in October. It seems so long ago now. It focuses on my daughter Taylor's Minecraft world, and was displayed at the MakerSpace area. It demonstrates the potential of Minecraft to develop critical thinking and creativity. I made the video using low-tech and "high"-tech means. Low-tech... recording with my phone... Not so high-tech with my use of MovieMaker. The video was used at the YQR Edcamp held at the University of Regina. As you probably already know, Genna Rodriguez and Danielle Maley were also part of organizing the event. I just wanted to include this video as part of my learning journey in this course. I love Pearl Trees for curating digital tools. Just thought I would share a few curated resources for you, from my folder of Digital Fluency Tools. If you are interested in using curating or Social Bookmarking tools, there is Livebinders, Delicious, Diigo... all are free. As you can see from my post, I have embedded the Pearl tree.